Thick and hearty, this butternut squash + red lentil soup is made with just 5 ingredients, plus oil, salt & pepper, and SO easy to make! 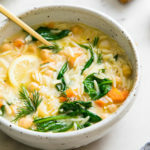 I thought this soup was going to be a completely ho-hum recipe, especially with such minimal ingredients, but I was pleasantly surprised because it was delicious! I should have remembered butternut squash doesn’t need much from my last recipe, Roasted Butternut Squash Soup. It’s been awhile since I’ve made butternut squash soup and unlike my last one, this one with lentils included makes it very filling on it’s own. This truly is a simple recipe, from the ingredients to prepping and cooking. Peeling the squash is the hardest part, and really it’s not so bad. No need to roast your butternut squash either, simply make your soup in one big pot. 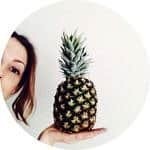 Planning on meal prepping? This butternut squash + red lentil soup can be made ahead of time and reheated when ready serve! Keep it stored in the refrigerator for up to 1 week, or freeze for up to 2 months. All together, the flavors are perfect for fall. This would be a colorful and delicious starter soup for the holiday table too! 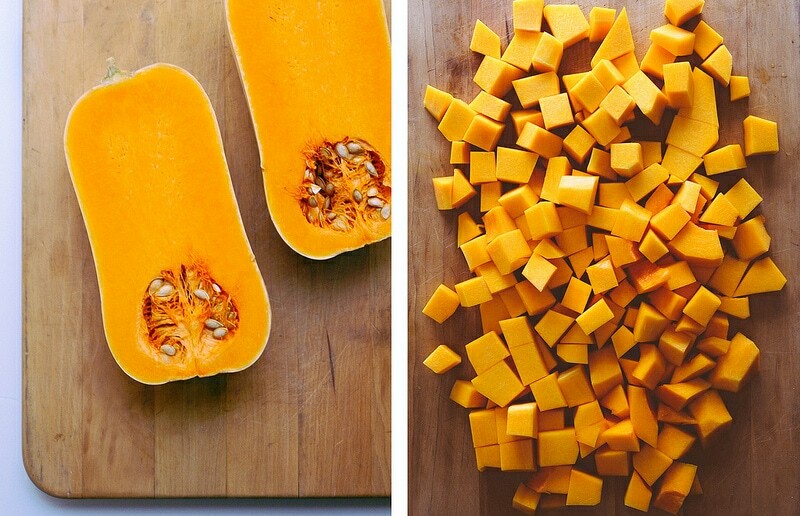 Butternut squash with its sweet flavored, brightly colored flesh is a great source of omega 3s and beta-carotene. It’s also an excellent source of various vitamins like vitamin A, C & B-6 and trace elements such as manganese, copper, potassium and folate. When available, enjoy the winter squash often. See all recipes on TSV using Butternut Squash! As a vegan, I’m always doing my best to add in high protein plant-based sources when I can, the addition of lentils are perfect for that while adding extra thickness to the overall soup. Lentils of all color should be a part of any heart healthy diet. Here you can find all recipes on TSV using Lentils! The addition of sage is perfect for the fall season and holds its own health benefits, like boosting brain function and working as an anti-inflammatory. Two great reasons to add this herb wherever you can! Find all recipes on TSV using Sage. Keep in mind the smaller you chop your butternut squash, the quicker it will cook. Add in chopped carrots, about 2 large, if you like. Feel free to enjoy this soup without blending. Or use a potato masher instead of pureeing, this will add some creaminess while still leaving a little chunkiness. 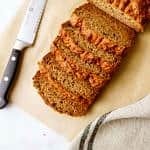 Only use red lentils with this recipe. Using other lentils will turn the soup a muddy color, and other lentils take longer to cook. 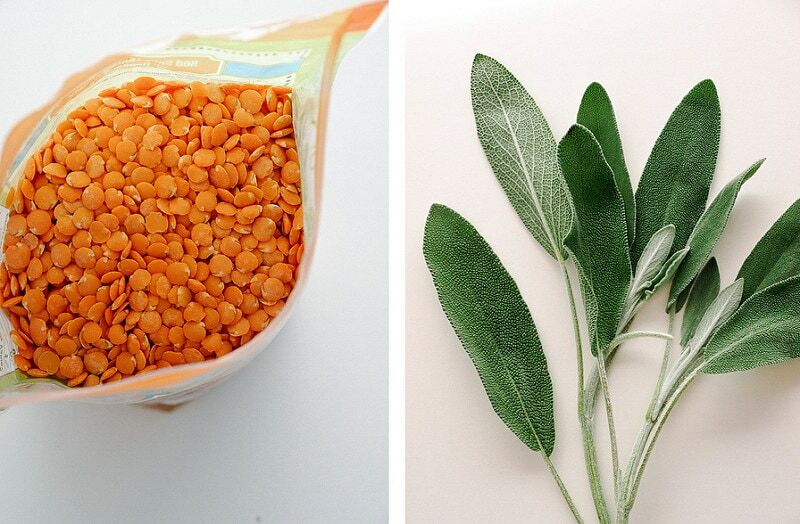 If you can’t find red lentils at your local grocery store, try ordering them online. This soup is meant to be thick but feel free to add a tad more water to thin it out if you like. Cook soup: Saute the onions, add the sage and squash and cook a few minutes stirring occasionally. Add lentils, broth and salt & pepper, bring to a boil, cover, reduce heat and simmer for 30 minutes, will be done when squash is fork tender and lentils are soft. 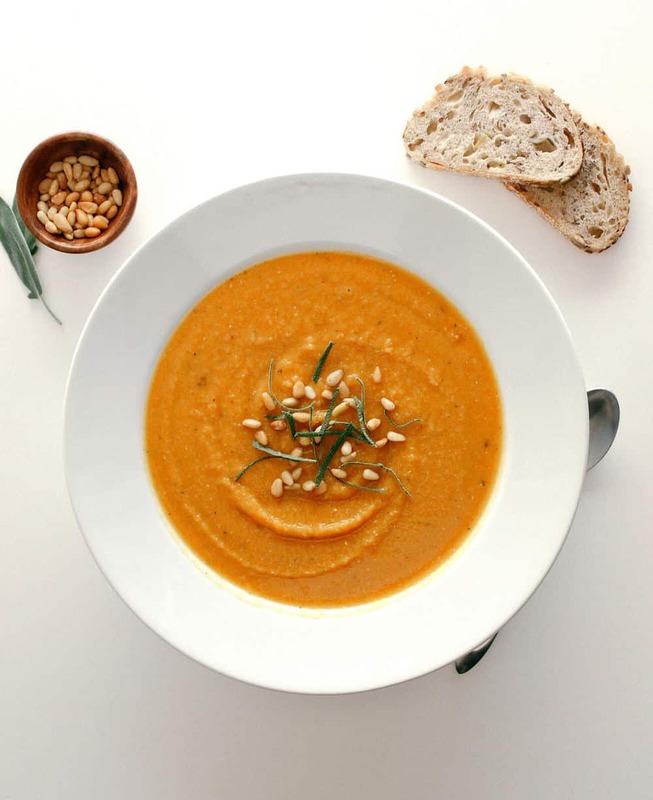 Puree: Once soup has slightly cooled, puree using an immersion blender or food processor (this latter method may take two or three batches to complete). Add extra liquids as needed for desired thickness. 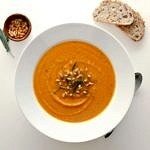 And that’s it, colorful, hearty and delicious butternut squash + lentil soup, made easy and healthy! You can never have too ways to use this flavorful squash. 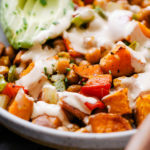 Give these butternut squash recipes a try, you just may find a new favorite for the meal rotation! See all Butternut Squash recipes on TSV! Rich in protein and lightly flavored with sage, this one pot soup is so healthy, easy and simple. Can be made a day or two ahead and reheated as needed. Cook soup: In a large dutch oven or stock pot, heat oil/water over medium high heat, add onions and saute for about 5 minutes, or until soft. Add sage and squash and cook a few minutes stirring occasionally. Add lentils, broth and salt & pepper, bring to a boil, cover, reduce heat to low and simmer for about 30 minutes, until squash is fork tender and lentils are soft. 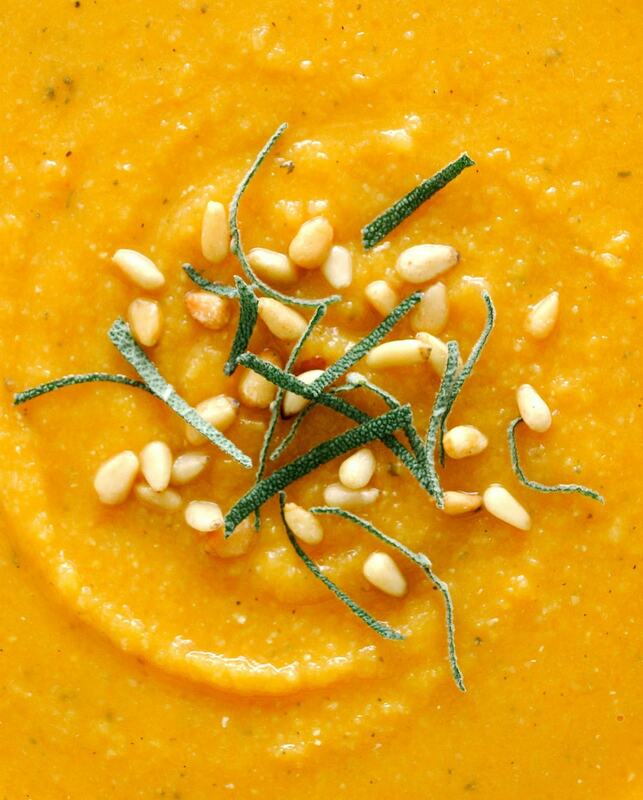 Puree: Once ready and slightly cooled, puree soup using your preferred method. Use an immersion blender and puree soup right in the pot until desired consistency. Or you can puree in your blender or food processor, this method may take two or three batches to complete. Add extra liquids as needed for desired thickness. Serve topped with pine nuts and chopped sage if you like, fresh cracked pepper would also be great. I used half water, half broth for this recipe. I use Better Than Bouillon paste, about 1 heaping teaspoon with 3 1/2 cups water. I find that’s plenty of flavor and my soup was great. If not using vegetable broth, I might suggest adding a half teaspoon or so of garlic powder, onion powder and maybe a smidge of coriander to bring some extra flavors to the soup.Keep in mind the smaller you chop your butternut squash, the quicker it will cook. Try to keep them around 3/4″ or smaller. You may just as well enjoy this soup without blending. Or you may like to use a potato masher instead, this will add some creaminess while still leaving some chunkiness. Only red lentils will work with this recipe. For one, the color would be altered making it look muddied. Secondly, other lentils take longer longer to cook. If you can’t find red lentils at your local grocery store, try ordering them online. Try using this as a pasta sauce or serve with a serving of rice. This can be made a day or two ahead and reheated when ready to serve. I used green lentils which made it look like split pea soup but it still tasted delicious! I’m afraid it was a bit bland for me so twicked the receipe slightly. Not sure if it matters though but I used a Hokkaido pumpkin. After adding a couple of cooking apples (chopped and wizzed up with a hand blender raw when the soup was already cooked and puréed) and some ginger it ended up tasting delicious. Saying that I do like rather distinct flavours :) thanks! This was an awesome recipe!! I made it primarily for my daughter, who eats blended food, so I substituted blended frozen butternut squash in the recipe to save me some prep time. Other than that I followed the directions, using veggie broth, and it tastes fantastic and clean and fresh. I had a large bowl before I froze it for her :). Thank you! I bought red lentils this afternoon to make into soup with the butternut squash in the refrigerator. I will, however, use my usual cinnamon, nutmeg, clove type of spicing. I never peel butternut–the skin is reasonably thin, and after pureeing it’s hard to notice a difference. You obviously know how to make a tasty soup. DAMN. 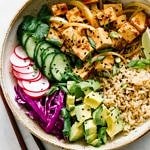 I just made this recipe (with a few variations to meet my budget) and, similarly to you, I was shocked by how dang good it is. It tastes like a turkey dinner in a bowl. except it’s all veggies. my life is now sage. I’m going to mention this recipe in a blog post tomorrow. Excited to dig through more of your blog! 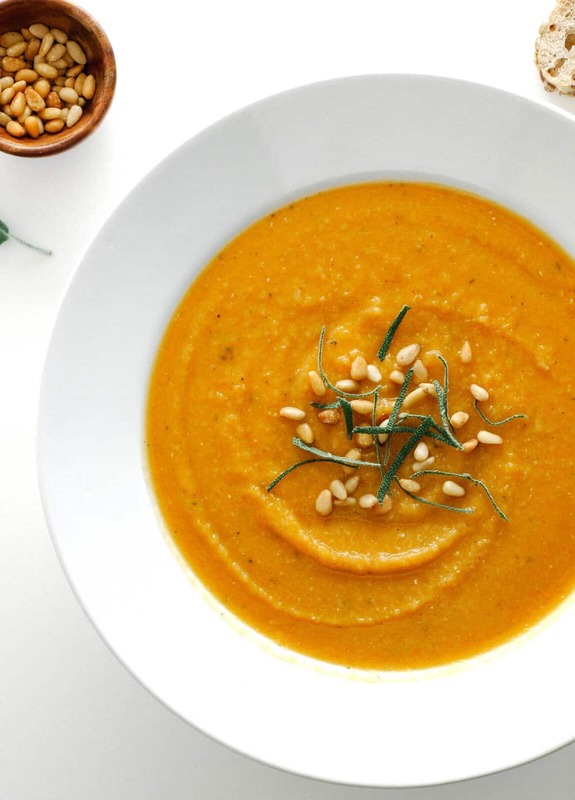 I was in the mood for a butternut squash soup last night and looked through quite a few recipes before I found this one. Although I’ve never made squash soup, it looked not only easy but delicious. It’s perfect. I took it to a gathering today and got several compliments on how delicious it is. Thanks! made this for lunch today! SO GOOD! didn't have pine nuts which was a bummer… next time! Just finish blending with my immersion blender. It is outstanding! Julie, I tried this recipe tonight, and like you, I found it better than I had anticipated. The pine nuts were just right for a garnish. We're having our first really cold weather here, and this soup took the chill off. I've been a vegetarian for decades and can't remember the taste of meat, but this soup brought back a taste memory I can't quite place —– maybe my mother's turkey gravy? Interesting. Tomorrow I'll try it as a pasta sauce. Thanks. Sage and squash go so nicely together. This soup looks lovely and simple. The easiest, silkiest butternut squash soup ever. I never know what to do with lentils, but they sound like the perfect pairing for a butternut squash soup. I love the simple elegance of this soup! This is absolutely beautifulllllll! And the recipe is so simple!! It sounds amazing. Butternut squash and sage are a match made in heaven! This looks perfect. I love when simple ingredients have an amazing outcome! This soup is pure beauty. I simply can not wait to try it. Butternut squash is my favorite squash (sorry kabocha you are second!). Thanks for sharing this might be on the Thanksgiving menu!